Okay, so I didn't like the Nokia 5800 that much, I liked the Nokia N97 though but reports about several bugs and problems with the hardware made me stop in my tracks to go out and buy one. Thankfully, I don't have to shell out any money to review the Nokia 5530 XpressMusic mobile phone. However, I'm in the market for my second handset and the Nokia 5530's price point makes it appealing so, should you and I buy it? I must admit, the Nokia 5530 XpressMusic's design is a lot like its older brother, the 5800 although the former has a smaller screen size at 2.9 inches while the Nokia 5800 has a larger one. Still the size difference is very minimal. Being the same as its older brother in terms of design, didn't really attract me that much to the Nokia 5530, not because it's ugly but because one of my criterias for a second handset is that it has to have a physical keypad of some sort. Anyways, going back to the design, the Nokia 5530's top side houses the power button, on the left side, there's some sort of flap which covers the memory card slot and the sim card slot, similar to the Nokia 5800 (except for the big flap). On the other side is the volume control as well as the display lock and on the bottom is the 3.5mm audio jack, charger socket, microUSB port, and the stylus slot. Nokia removed any physical keys on the front of the 5530 so even the call, end, and xpressmusic buttons are touch sensitive. Design-wise, compared with the Nokia 5800, I think I prefer the Nokia 5530 more. 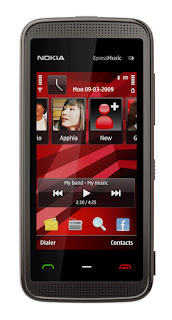 If you already own the Nokia 5800 XpressMusic, then there's really not much difference in terms of software except for the homescreen. In the homescreen, there's a scrolling contacts bar which is pretty cool except that I probably won't find that much use to it since I really don't put pictures of my contacts (except for three people; my boyfriend, my mom, and my best friend), but hey, maybe I can put pictures of famous people in my contacts list to spice up the 5530's homescreen. Anyways, the Nokia 5530 is a watered down version of the Nokia 5800 so basically, it's the Nokia 5800 without the GPS, 3G, and 5 megapixel camera. The Nokia 5530 did retain the WiFi though and the accelerometer, and the 3.2 megapixel camera is not that bad. Some people might complain that they would prefer the 3G over WiFi so I guess it really depends on your preference. Me? I prefer the 3G but only because I seldom come upon a free hotspot and besides, ever since I've heard of WiFi stealing, I rarely connect to free WiFi in a public area. 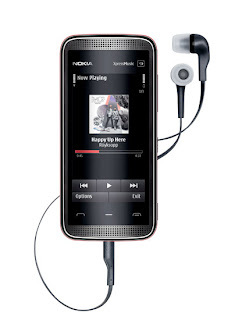 Music-wise, the Nokia 5530 is a very good music player, The included headset is great compared to what was included in the 5800. I like the music player on the Nokia 5530 as you can adjust the sound balance and use stereo widening. Unlike the Nokia 5800, which kept kinetic scrolling at minimal, the 5530 offers more kinetic scrolling, like the contacts widget on the homescreen. The accelerometer rotation lags a bit. Sunlight legibility is good though, better than my Omnia. The messaging application is similar to Samsung's, you only get the QWERTY keypad in landscape mode. Although the Nokia 5530's price point is not as cheap as the LG Cookie, Samsung Tocco Lite, and Samsung Blade/Preston, unlocked, when this phone becomes subsidized under a mobile phone contract plan, it would be in equal footing as with the other 3 since expect carriers to offer this for free. So when confronted with all these choices of low to mid-range touchscreen mobile phones, which should you choose? Well, if you prefer WiFi over 3G, the Nokia 5530 is the only mobile phone amongst the three to offer WiFi and it is only the Samsung Blade that offers 3G. What the Tocco Lite and LG Cookie offers though is a fun user interface with widgets. Of course, once the Samsung Omnia Lite comes into the picture, then we can have a head to head battle with the former and the Nokia 5530 since both essentially have the same features with the former adding 3G to the table. Of course, it would depend on how much the Samsung Omnia Lite would be priced. For those already with the Nokia 5800, I don't think the Nokia 5530 is worth swapping your existing mobile phone for, unless you REALLY want that scrolling contacts homescreen. The Nokia 5530 is a very good choice though, for those who just wants a touchscreen mobile phone without spending too much dough. 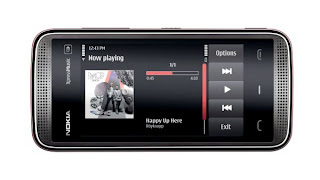 Of course, they can always opt for the Samsung Tocco Lite or LG Cookie but the Nokia 5530 is definitely a better music player. For those without much preference and just wants a touchscreen phone, they would have a hard time choosing amongst all the affordable touchscreen mobile phones available but I'm sure the Nokia 5530 won't find it hard to find a following of its own. I have this phone. Really bad camera. @anonymous: Thanks for the feedback. I'm debating on whether to get this or the Samsung Tocco Lite. Is the camera any better on the Tocco Lite? IMO, the Tocco Lite has better camera because it offers smile shot, which I think is a pretty cool feature. A lot of people doesn't seem to like the 5530's image quality. For me the 5530's image quality is okay but I still prefer the Tocco Lite's camera. Sorry but the 5800 has a 3.2 not a 5 megapixel camera and the 5530 has slightly better picture quality. should i buy nokia 5530 or 5800 or galaxy 5???????? Definitely I'd go for the Galaxy 5. It's an Android phone already, already has a lot of free apps compared with Nokia and the UI is just much more faster.